Now that it’s finally getting hot out, it’s time to hit the water. Relax in style with one of these amazing pool floats. 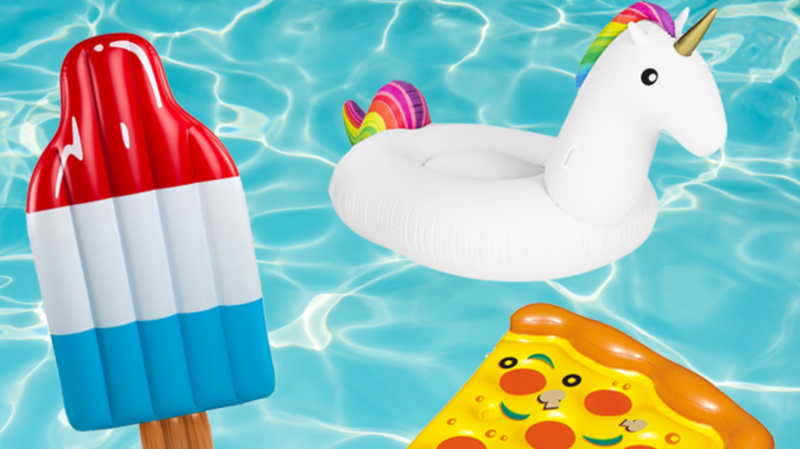 What’s better for summer than a pool float shaped like an iconic tri-colored ice pop? Unlike the edible kind, these inflatable pops are 6 feet tall and perfect for even most adults to enjoy. This giant gumball machine is 5 feet tall and comes with a ring in the center to sit in. The bottom part of the machine is perfect for resting feet. The “glass” part is clear plastic to mimic the real thing. This 9-foot-long unicorn floatie is definitely the most magical thing you can add to your pool. This gigantic creature can hold over 400 pounds and comfortably sits two people. There are handles on the neck, so yes, you can totally live out your dreams of riding a unicorn. For a sweet time in the pool, grab one of these large gummy bears to relax in. The sugary float stands at 5 feet tall and is made with a tough vinyl that can hold up to 200 pounds. It comes in both red and green. If you’re looking for a dessert-oriented floatie, try out one of these doughnut inner tubes that come in strawberry and chocolate (pink and brown). The sprinkled doughnuts are 4 feet wide and made with durable vinyl. Despite being pretty tough, it comes with a patch kit just in case you hit a snag on the lazy river. Ride around the pool in style at your next Fourth of July barbeque with this extremely patriotic float. It’s shaped like a bald eagle with an American flag across the back, perfect for celebrating the United States. The durable PVC material allows for use in a pool, lake, or ocean. It’s 8 feet across so two adults to sit on it without being too squished together. Turn your pool into a tropical rainforest with a toucan pool toy. The floatie comes with a head, wings, and tail. The neck has handles to hold onto when riding the float around in the water. Despite the dark color of the floatie, it stays cool in the sun thanks to its vinyl exterior. The huge bird is 7.5 feet long and can hold a whopping 400 pounds before sinking. Ever want to cuddle up with a piece of pizza but without the grease stains? This pizza pool float can make that a reality. It’s 6 feet long, meaning most adults can lay on it comfortably. For a real pool pizza party, there are bungee connectors on the sides to connect the slice to other slices—you can even form a whole pie with eight of your friends. For more New York food fare, check out this everything bagel. Just like the doughnut, the bagel is the perfect shape to be transformed into an innertube. The delicious looking floatie comes with a bungee connector so you can hook up with another bagel lover while floating around. The young (and young at heart) will love this intimidating-looking, 6.5-foot-long T.rex that stalks pools, lakes, and rivers. It even comes with some tiny arms that wobble as you move around. If your float doesn’t come with a cup holder, your drink is going to need a float of its own. These floating coasters look like pink flamingos, making them perfect for pool parties and luaus. For added fun, you can get a big matching flamingo to ride. Reenact your wildest pirate dreams with this inflatable fortress. To enter, there’s a a swim-through ring in the center and a working drawbridge. To protect the float from enemy pirates, there are also three inflatable swords and shields included in the box. This fun spiral-shaped float looks just like a sea serpent. The two-toned toy has a head on either side for double the fun. It stands just under 4 feet tall, making it a good size for children to enjoy. Text your friends (with a waterproof case, hopefully) on this 5-foot-wide emoji-shaped float toy. The heart-eyed face is the perfect symbol to show your love for the summer. This gorgeous pool float is made with a shimmery transparent vinyl. At seven feet long, it's the perfect size to recreate Botticelli's The Birth of Venus.